With summer looming, marijuana growers from California to Massachusetts will confront untried regulations and potentially greater enforcement of water-related rules. The development is likely to spread as more states legalize cannabis, presenting MJ growers with additional regulatory oversight and costs. State and local water officials in California – where regulators and growers are trying a new water-conservation scheme – have said they will send inspectors to legal grows to ensure they’re complying with the rules. In other states where legal marijuana growing and scarce water resources have intersected, such as Oregon, there are greater calls to ensure marijuana growers are adhering to water-related rules. Newer legalization states, meanwhile, are including water and other environmental provisions in their regulations. For example, regulations that Massachusetts recently adopted require growers to keep records of their water and energy use and to meet certain environmental standards. “This issue is not going to go away,” said Perry Salzhauer, an attorney with the Green Light Law Group in Portland, Oregon, who has several cultivation clients who have had to obtain water-rights permits. Growers in these states, however, shouldn’t necessarily expect raids aimed at shutting them down. Rather, state officials are more likely recommend how to remedy any water violations, according to one official. “You can’t just go out and come down heavy-handed if people are trying to comply,” said Cris Carrigan, head of the Office of Enforcement at the California State Water Resources Control Board, a division of the state Environmental Protection Agency. The regulations and the relatively gentle approach are meant to achieve the environmental goals that regulators desire while not scaring growers off into the unregulated black market, where they are more likely to flaunt water-use rules. It’s not an easy line to walk, observers said, and the issue of growing water demand by cannabis cultivators is something that most states – particularly in the arid West – didn’t anticipate and therefore failed to address when formulating their regulations. “Many states have just begun thinking about the relationship between water resources and marijuana cultivation,” said Ryan Stoa, a professor at Concordia University in Portland, Oregon, who has written extensively about the issue. “We’re seeing the states give a good try. But in many there are still issues that need to be ironed out,” Stoa said. The controversy over the voluminous water use among U.S. marijuana growers has come into focus as more states have legalized cannabis. The legalization coincided with falling water levels in tributaries and other water sources going back more than 20 years. Receding water levels can’t be blamed on the marijuana sector alone, industry advocates and regulators said. Many other types of large farms have also appeared over the past few decades and are even more responsible for heavy water use that is draining water sources dangerously low. “There’s a tendency to discriminate against marijuana growers, and exaggerate things, and paint them as negligent with water,” said Don Morese, executive director of the Oregon Cannabis Business Association. Last October, California environmental regulators adopted rules requiring cannabis growers to obtain a water-rights permit in order to get a cultivation license from the state. The rules also said that marijuana farmers who had riparian rights would not be allowed to divert river and stream flows during the summer months – when the demand on water is the highest but also when water is needed in waterways to support fish and plant life. Instead, growers are required to build storage facilities – such as holding tanks or pond reservoirs – where they can catch and retain water during the winter months and then use it in the summer rather than tapping waterways. While Stoa welcomes regulations, he said that particular approach has shortcomings. For starters, it requires farmers to give up their water rights and spend time and money on storage from which they can draw water during the summer. 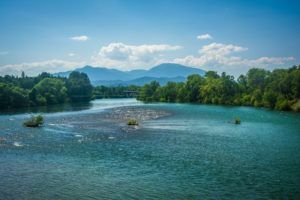 “To tell people they can’t draw water from the stream passing through their property is a big change, especially when they have rights to that water,” Stoa said. Growers also complain about slow response times from environmental regulators, Stoa said. “We’re at an interesting point here where you have farmers who want to go legal but are being frustrated by bureaucracy and consider dropping out,” he noted. Carrigan said California has provided enticements such as faster processing of marijuana business license applications that submit to the water-catchment approach instead of standard water permitting. Growers have until next spring to build water-storage systems. Another shortcoming of the California regulations and other states with similar rules, Stoa said, is that they are hard to enforce, especially against black-market growers. Licensed growers, by comparison, are easy to locate because they are on the government’s radar, and they’ve been receiving water-use inspection visits, according to industry sources. Black-market growers are, of course, harder to find, and there are not enough inspectors to visit all illegal grows. “The state doesn’t have anywhere close to the resources necessary to inspect farmers that are not seeking licenses,” Stoa said. Carrigan acknowledged the challenge but noted that legal growers who do follow water rules are more likely to tell regulators about competitors who don’t. Some Oregon counties have called for federal enforcement in their counties.. Marijuana cultivation is out of control and needs a reality check .. Enforcement at all levels will be the norm in Oregon from harvest 2018 going forward ..
Cannabis is no different than any other agricultural product grown in California. Rules are rules and are meant for the good of the environment, community and all people, who live in the state. There is no more business as usual for the Cannabis Industry, either get a license or become a criminal. We are now subject to the same regulations that grape growers have to abide by on the north coast, capturing water for irrigation, frost control, etc. If you subscribe to the Cali Water Agency news, you would see all the requests for water withdrawals by vineyards to fill their ponds BEFORE summer and remember they need to be engineered and approved by the county. You should also read the law regarding the riparian water rights you think you have, Just because you have water flowing across your land does not mean it is yours (blue line vs. intermittent). Do you know what lives in, on or near it or depends upon it ? Drill a well and use storage tanks or bladders. Be thankful you live in a county that has a sensible sheriff and reasonable supervisors as opposed to Fresno County that has neither. I know that here in Nevada we have grow facilities that recycle every drop of water they can catch. On the international space station they pull water out of the air onboard as part of their recycling process. I was born and raised in California, I lived there for the better part of thirty seven years and there is one thing I can tell you about California there is an abundance of fog. The forests in northern coastal California have some of the oldest trees in the world as well as the tallest. Some of those forest derive the equivalent of 30″ of rain per year just from the fog alone. If a forest can condense that much water from the fog just think what a little human enjanuety might capable of. If you operate a large grow facility jus think what you could do if you were to capture the water that falls on your roof and store it, for use to augment your water supply. There are solutions out there.